When I type the words “perfect kid,” you have an image that pops into your mind. What do you see? Perhaps it’s a tall, photogenic football player with the gleaming smile that takes off his helmet and runs to the sidelines after scoring the winning touchdown in the final game of his senior year! Perhaps it’s the lean, strong swimmer that just made her personal best in her 50 fly to make it to Regionals. But we don’t usually think that it’s the kid crying because he knows there’s a test at the end of the week, and he’s so stressed that he just threw a pen across the room, losing the last ticket he needed to join the other kids at the weekly pizza party. We don’t think that it’s the kid that so perseverates on dinosaurs that she can’t discuss anything else, and refuses to eat anything that is the color red (this week). My son, Bodie, has dysgraphia and orthographic processing disorder. He HATES to write. HATES. IT. It hurts, sometimes, when he has to manipulate a pen or pencil and put thoughts down on paper. If you were to ask him to copy a verse from the Bible, he would do it. But if you ask him to write a paragraph about the day that his sister was born (which he says was one of his “best days”), he can’t. It is seriously too hard to take the emotion of that day and put it into words on paper. He is limited by his challenge. Perhaps, because I am also his teacher, I have not pushed him as hard as I should when it comes to writing. That’s why he attends tutoring for his disability, so she can push him and I can still remain Mom. Bo has had to learn strategies to overcome that which is hard for him. In life, we all develop coping strategies to overcome our weaknesses. Children with special needs are given the challenge of having to develop these strategies in a manner that is a little more public. As adults, we don’t parade our struggles around for others to witness. We don’t invite friends over to watch as I bomb making a chicken pot pie from scratch (total bomb in my house — cannot even remotely master a pie crust from scratch, no idea why). My strategy: store-bought pie crust. But kids, kids don’t have the opportunity to hit Trader Joe’s for a box of “how to control your body when it feels too wiggly,” or “how to stop flapping when your Tourettes is flaring,” or “how to breathe when your new friend is sitting in YOUR seat at the lunch table.” Kids have to learn hard lessons now, so they can bloom later. It’s not fair. But it just is. The first kid, the football player, I believe in my heart will be my son. The stunning blonde football player with the biggest smile, scoring the touchdown. The girl? That was me (okay, okay, you caught me, I wasn’t ever lean, but hey, I’m the author here). Every kid struggles — some are just given bigger challenges earlier on. Sometimes when I put Bodie to bed at night I will say to him, “You know what? If I had to choose any kid in the world… if you lined them up in front of me, I would choose you. Not Elijah. Not Josiah. Not Caleb. Not Mark. You. You are fearfully and wonderfully made. Just as you are.” He always smiles and goes to sleep confident that he is “perfect” in my eyes. Your child is perfectly made. You may feel like the world can’t see it. You may feel like teachers can’t see it. You may feel like friends can’t see it. And all of that may be true. But your child was made for a purpose. You were gifted your child for a purpose. Even on your worst day, his or her worst day, they were made for good, just as they are. Keep walking with your kiddo. 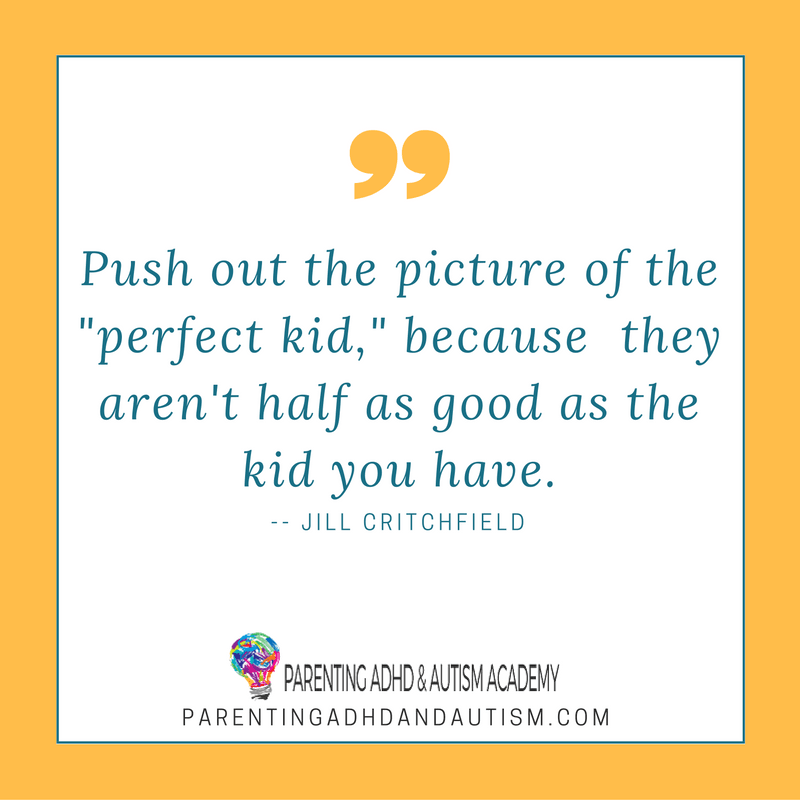 Push out the picture of the “perfect” kid, because trust me, they aren’t half as good as the one you have.